Flaherty's Crossing was originally inspired by Linda's father, Merle McPherren, who passed away on July 15, 1991 with the love of his life, his wife Jean, at his side. His Irish wit, stubbornness, and the bravery he exuded during his relentless battle with terminal cancer sparked the idea for a novel and was further developed and edited with the assistance of Kristina McMorris, Linda's eldest daughter. Not only does this faith-seeking tale delve into the complex emotions of bidding a final farewell to an estranged parent, but it also explores the strain placed on a marital relationship when childhood issues go unresolved. Even though it is a fictional story, it made me reflect on my own life, and how I shouldn't wait until it is too late to let people that I love know how I feel, or to apologize if I need to. A well-written book dealing with difficult issues of love, loss, healing, and faith, and never slipping into maudlin territory. A great debut novel! 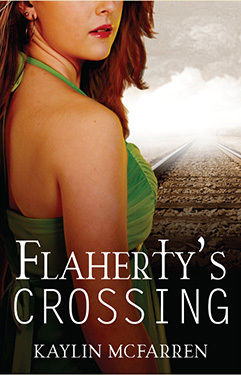 Flaherty's Crossing is a powerful and inspiring read, highly recommended. Just as the road straightened, her fingers found the phone at the bottom of her purse. She pulled it out and pressed 2 on the keypad to speed dial the house. Ringing, ringing. Drew's voice on the answering machine: "Hi, you've reached the home of Drew Coleman and Kate Flaherty." Kate had appreciated her husband's understanding when she wanted to keep her maiden name due to her blossoming career. Tonight though, something about hearing him state their names separately only underscored the fact they'd become little more than roommates. Her spirit sank a notch. "Sorry you missed us," he continued. "Please leave a message, or you can connect to our cell phones by pressing one for Drew or two for Kate. Thanks." A long silence. Then a beep. "Hi, it's me," she said. "I got a call today about my father. His health...he isn't doing well." How was she going to explain this? She'd never told Drew her father's "cured" status hadn't lasted, hoped somehow she'd never have to. But after the message he'd left, she had no choice. "I thought you'd be home by now. Just...call me when you get this." Where could he be? His flight should have landed hours ago. Impatience increased her speed. She drove through the little town of Hoodsport so quickly that if she'd blinked, she would have missed it. For the next few miles, the scattered remains of Fourth of July stands and unkempt yards filled with rusted vehicles speckled both sides of the highway. On her left, the florescent sign of the Lucky Dog Casino promoted huge jackpot winnings, reminding her that for others happiness was a mere pull on a slot machine away. When she came around the next bend, a bright orange sign jumped in front of her car. She stomped on the brakes and veered off the main highway like a criminal in a high-speed police chase, barely missing a lineup of red flares and orange cones from a broken-down semi. Her pulse raced as she straightened the wheel. Where the heck was this taking her? A small white highway sign answered in unsympathetic black letters - 106. She huffed at the inconvenient route, one she hadn't taken in years. Cracking the window, she took a deep, sobering breath. In came the smell of damp fir from the trees stippling the sides of the remote road. For twenty minutes, not one vehicle followed her or passed in the oncoming lane. Street lamps became rarer, each yellow light shining dimmer than the last. A drive never felt so long. As her car jounced over the rough highway lining the Puget Sound, a layer of fog lifting from the dark waters swallowed the beams of her headlights. The ocean welcomed her back with its hazy abyss. The sounds of undulating static evidenced waves crashing on the shore. A crisp breeze brushed against her face, delivering a trace of salt to her tongue. She tried to remember how many years it had been since she'd spent time near the sea. Crabbing, fishing, water skiing: all her happiest memories with her dad had taken place by the water. As well as the most terrifying day of her life. Kate closed the window. She turned on the radio and flipped through the channels, all crackling between towers. A political debate. Advice for the lovelorn. The brain-itching chorus of "Gypsy Soul." She clicked it off. Her wheels screeched as she flew around another curve and onto the connecting highway. She released her foot from the gas pedal but, resisting the instinct to use the brakes, she shoved her foot back down to accelerate. Perhaps her way of defying death, or a desperate search for control. She lifted her phone and called home again, only to hear the same message on the machine. Suddenly, Drew's words came back to her: "Maybe we need to take a break." They'd had plenty of arguments in the past, but never before had he mentioned separating. What if he viewed her unexplained absence tonight as blatant apathy? Apprehension raised her blood pressure, burned the tips of her ears. She speed-dialed Drew's lifeline - his cell phone. It went straight to voicemail: "You've reached Drew Coleman with Milton, Sidis, and Stricklen. I'll be out of town until Monday. If this is an urgent matter, you can reach my assistant at..."
As Kate anxiously waited for the beep, she noted darkness in Drew's voice, a seriousness that had replaced the fun-loving spirit she'd fallen in love with. "Drew, I'm on my way home," she said. "I'm heading back from my father's. I'll explain when I see you. Anyway, there was a detour. I just took highway sixteen off one-o-six, so I shouldn't be more than forty minutes away." The glow of her headlights bounced off something ahead. It was an animal. A deer. Standing sideways in her lane. Kate dropped the phone. "No, no, no!" she yelled, jamming the brake pedal to the floor. She yanked back on the steering wheel as if pulling a B-52 out of a nosedive. In exaggerated slow motion, the deer turned its head toward her. No fear in its eyes. No attempt to move. Either at peace with its fate or unwavering in its defiance. The car's beams elongated the creature's shadow across the road, the distance between them vanishing. There wasn't time to stop; they were going to collide. Kate screamed, swerving into the hole of blackness off the edge of the highway. Every muscle in her body clenched, preparing for impact.